The Journal of Human Evolutionis publishing the results of the study, which developed new methods of fieldwork and analysis for researchers exploring the origins of tool making and meat eating in our ancestors. 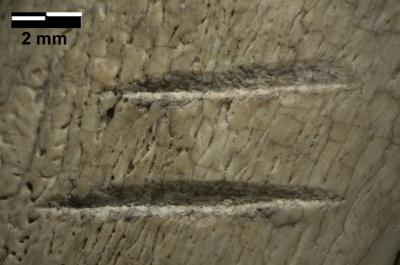 This is a detail of the marks on a fossilized rib bone, one of the two controversial bones. “The best match we have for the marks, using currently available data, would still be butchery with stone tools,” says Emory University anthropologist Jessica Thompson. Credit : Photo by Zeresenay Alemseged. The Nature paper was followed in 2011 by a rebuttal in the Proceedings of the National Academy of Sciences (PNAS), suggesting that the bones were marked by incidental trampling in abrasive sediments. That sparked a series of debates about the significance of the discovery and whether the bones had been trampled. For the current paper, Thompson and her co-authors examined the surfaces of a sample of more than 4000 other bones from the same deposits. They then used statistical methods to compare more than 450 marks found on those bones to experimental trampling marks and to the marks on the two controversial specimens. While some other apes are known to occasionally hunt and eat animals smaller than themselves, they do not hunt or eat larger animals that store abundant deposits of fat in the marrow of their long bones. A leading hypothesis in paleoanthropology is that a diet rich in animal protein combined with marrow fat provided the energy needed to fuel the larger human brain. The animal bones in the Dikika site, however, have been reliably dated to long before Homoemerged. They are from the same sediments and only slightly older than the 3.3-million-year-old fossils unearthed from Dikika belonging to the hominid species Australopithecus afarensis. A whole ecosystem of animals, insects, fungus and tree roots modify bones. Did they get buried quickly? Or were they exposed to the sun for a while? Were they gnawed by a rodent or chomped by a crocodile? Were they trampled on sandy soil or rocky ground? Or were they purposely cut, pounded or scraped with a tool of some kind? One way that experimental archeologists learn to interpret marks on fossil bones is by modifying modern-day bones. They hit bones with hammer stones, feed them to carnivores and trample them on various substrates, then study the results. The PNAS rebuttal paper, however, also used experimental methods and came to the conclusion that the marks were characteristic of trampling. Thompson realized that data from a larger sample of fossils were needed to chip away at the mystery. The current paper investigated with microscopic scrutiny all non-hominin fossils collected from the Hadar Formation at Dikika. The researchers collected a random sample of fossils from the same deposits as the controversial specimens, as well as nearby deposits. They measured shapes and sizes of marks on the fossil bones. Then they compared the characteristics of the fossil marks statistically to the experimental marks reported in the PNASrebuttal paper as being typical of trampling damage. They also investigated the angularity of sand grains at the site and found that they were rounded – not the angular type that might produce striations on a trampled bone. Trample marks tend to be shallow, sinuous or curvy. Purposeful cuts from a tool tend to be straight and create a narrow V-shaped groove, while a tooth tends to make a U-shaped groove. The study measured and quantified such damage to modern-day bones for comparison to the fossilized ones.